Meticulous auto detailing, paint protection, correction and restoration. As San Diego’s leading Car, Auto, Mobile Detailing service, we at Apple Polishing Systems Car, Auto, Mobile Detailing and Wash reverse, restore and help to prevent the signs of aging with industry leading Car, Auto, Mobile detailing products, procedures and techniques only used by the absolute best San Diego’s Car, Auto, Mobile detailing Specialist and San Diego’s Paint Protection professionals. 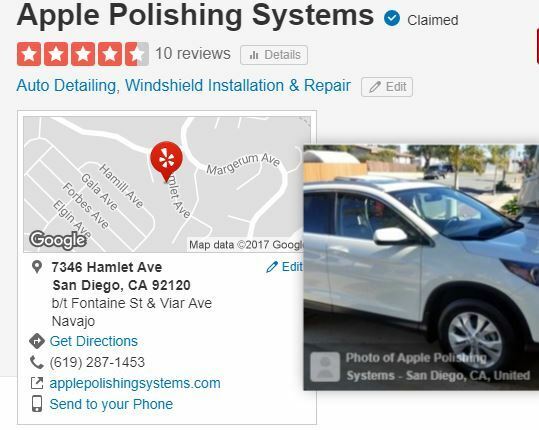 Auto Detailing San Diego – At Apple Polishing Systems our goal is to provide the most convenient and comprehensive auto detailing service in San Diego. Our Complete Detailing Packages are among our most popular service and they include both interior and exterior detailing. However, if you don’t see what you’re looking for let us personally tailor a package to meet your needs and budget…. We strive for your complete satisfaction, from a deep mirror like paint finish to meticulous cleaning of your car’s interior with close attention to detail. My mom's car was stolen and used for a drug party. The police found it but it was disgusting! She didn't want to go anywhere near it. Paul came today and worked his magic!! It looks brand new and my mom is thrilled!! It's sanitized and beautiful...she can't wait to drive it. These guys are legit... I had a need for some serious TLC for my truck on a very short notice and one call took care of it. Paul showed up in an hour and had my truck looking new in no time. All the small scratches just vanished and the truck is super smooth.The prices are very competitive too. We started using Apple Polishing Systems about 8 years ago from a friend's recommendation. Over the years, they have detailed our cars at least annually. Their quality of service is spot-on in all regards. We have also had several windshield dings repaired, with no future issues.